Better tighten the doohickey first. Gibbs: Anything I can do? Bishop: Uh, it's pretty self-explanatory, really. Gibbs: Did you check to see if that little gizmo there is attached to that other giddy-bop? Bishop: Mmm. Not yet. You think that'll do it? Gibbs: If you spit on it. Sometimes that works. 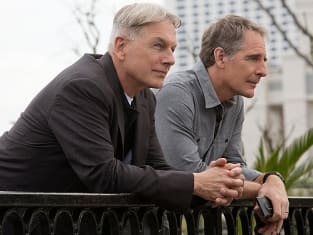 NCIS Season 11 Episode 18: "Crescent City"
Pride: Laissez les bon temps rouler. Gibbs: Let the good times roll. Permalink: A popular Louisiana saying, especially at Mardi Gras. Bishop: Where can I sit? Is the floor clean? Do you have any sugar? Lots of it? Brodie: Three-letter word for mistake. Err. Permalink: To err is human. NCIS Round Table: "Crescent City"